There were probably some good lessons to be found about teamwork or togetherness in Disney's '90s cartoon DuckTales, but most kids took away a different message. Specifically that you could theoretically fill a swimming pool with gold coins and have a wonderful time swimming around in it, just like Scrooge McDuck. While some of us had some painful experiences rolling around on pennies to recreate what we saw on TV, today's youth will get to experience the real thing. To promote the forthcoming DuckTales reboot, Disney has created a real-life money bin for fans to writhe around in. As Live105 reports, the bin is filled with 30,000 "gold coins." In reality, it's more of a ball pit as the coins are made of plastic. Either way, the lucky visitors must finally have that coveted feeling of actually becoming Scrooge McDuck. 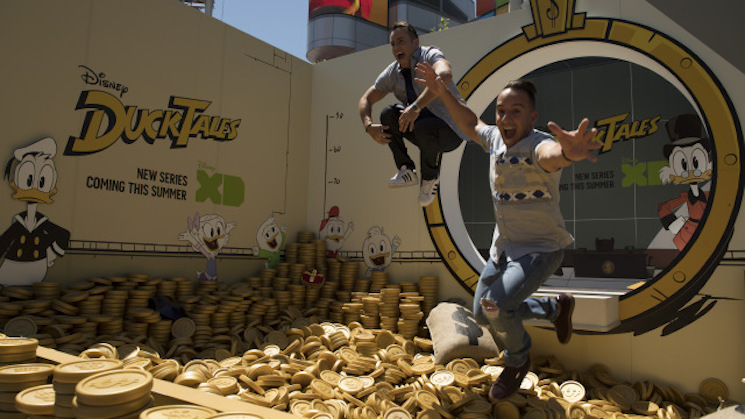 The money pit was debuted at the Radio Disney Music Awards, and will next be available for a coin dip at the D23 Expo 2017, which takes place from July 14 to 16 in Anaheim. Meanwhile, the new DuckTales features voice acting from David Tennant, Danny Pudi, Ben Schwartz, Bobby Moynihan, Beck Bennett and Kate Micucci. It'll hit small screens this summer.